1913 Bath House Inventory, p. 38, no. 209, in the Red Room, in the 'showcase to the left of the fireplace', the figure erroneously described as holding a melon in her left hand. 1914 Wernher Inventory, p. 38, no. 197, again erroneously describing the pomegranate as a melon. A design for a more elaborate drinking cup of similar form by Paulus Flindt, Nuremberg, 1600, is illustrated by J. Haywood (Virtuoso Goldsmiths 1540-1620, 1976, fig. 182). He notes that in use, the cup was reversed and could not be set down until it was drained. Cf. 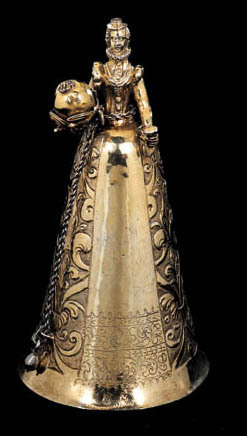 another example by Meinrad Bauch the Elder, Nuremberg, circa 1600, holding in her left hand a chain, terminating in an acorn (Christie's, Geneva, 9 November 1976, lot 243).